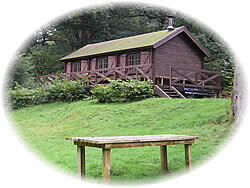 Welcome To Border Game Angling - Angling Holidays in the Eden Valley, Salmon, Sea Trout, Brown Trout and Grayling, UK Fly Fishing Holidays. 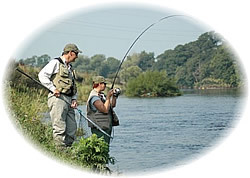 All the beats used by Border Game Angling are private as it is appreciated that when you take a fishing holiday that you do so to chill out and do not want to be queuing behind several other anglers to secure your position to fish through a pool. 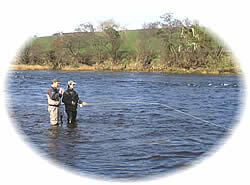 Your fishing trip should be a time to have fun & relax, and what better place to do so than The Eden Valley. Ferry, Road, Rail or Air? 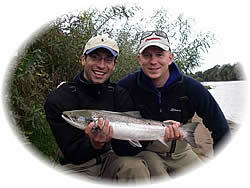 Grayling fishing is becoming more and more popular with the fly fisher and can produce some great sport with some exceptionally large fish taken throughout the day as well as good numbers being caught. Wild Brown Trout are always in abundance on the river and regularly taken on the fly with some nice specimens coming to the net. Early season sport can be very exciting. 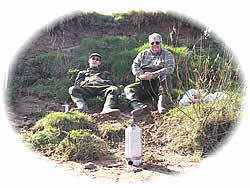 The Sea Trout fishing has most certainly declined over the past ten years, but there are still be some large early season trout and several much later than usual fish entering the system. Summer season night fishing can also produce some good results. 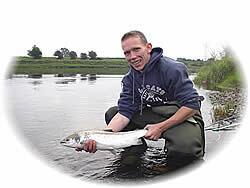 Salmon on the Eden can be prolific and over the last few seasons has most certainly gone from strength to strength with large numbers of fish entering the system. This season also saw many larger than average Spring fish in attendance. Long may it last.